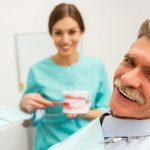 Once you’ve decided to explore dental implants to restore missing teeth, you’ve arrived at your next decision — finding the practitioner to do your work. What kind of practitioner should you look for? Some people think they might need to see a specialist, such as a prosthodontist or periodontist. The former specializes in restoring oral function by making and fitting artificial devices to replace missing teeth. The latter specializes in treating diseases and problems with bone, connective tissue and gums that surround and support the teeth. Both provide dental implants. But these days, practitioners in general dentistry routinely perform dental implants along with their more traditional work, and you can expect that most dentists will offer them. Find out how extensive a dentist’s training has been, how long he or she has been placing implants and how many he or she does annually. In many cases, when bone is sound, it’s possible to complete an implant in one day, but often, the procedure is done in stages, with gums being allowed to heal and bone allowed to grow along the way. That could take a year. The dentist will do an initial scan to determine a plan and a schedule for your work. He or she should also inform you if there are any complications involving sinuses or nerves and discuss advantages and disadvantages of treatment options. Ask the dentist to explain the technology that will be used to evaluate your bone, place the implant precisely and promote healing after surgery. How invasive is the process going to be? Many patients are apprehensive about surgery. But even though implants involve drilling into bone, bleeding and pain are minimal. At Pure Dental Health, we can offer IV sedation if you need that for anxiety. Some other patients are fine with the noise-canceling headphones and routine numbing of the area. Of course, we make patients comfortable afterward if they experience any swelling or pain. Are dental implants advisable for diabetics? Diabetes is no longer considered a risk factor for implants. If you’re a diabetic, you want to discuss any precautions the dentist will want to take. But studies show that diabetics can successfully be implanted, and, of course, when they replace missing teeth, they can eat a better diet to help them control their diabetes. Is there an age limit recommended for getting implants? Your dentist will examine your bone structure, determine your overall oral health and review your medical history. But there’s no age limit to restoring optimum function of your teeth. Or your appearance. What will dental implants cost? Cost is a big concern for most patients, especially if treatment will extend over months. Think of dental implants as an investment in your health and well-being. Replacing multiple teeth can easily exceed five figures, but more than 90 percent of implants can last for 10 years. Many people keep their implants the rest of their lives. Because of many factors, the price depends on your situation. So an evaluation is required. If financing is necessary for your situation, make sure that the practice offers that. At Pure Dental, we have financing options. Will your insurance cover dental implants? Call your prospective practice to ask what plans they accept. Keep in mind that they may have recently added your insurance provider to their network, even if you don’t see your carrier listed on their website. At Pure Dental Health, we currently accept all PPO insurance plans including, but not limited to, Blue Cross Blue Shield P.O., Cigna Radius, Delta Dental Premier, Guardian, Humana, United Concordia, MetLife, Aetna PPO, Cigna Core and United Healthcare. If you’re ready to discuss the possibility of having dental implants, please contact us at Pure Dental Health today. Schedule an appointment to learn more about how we can help you restore your smile and even your outlook on life. Should you get dental implants? If you’ve considered them, you should know that there are some indications that may make your decision easier. You got a cavity, or felt your bite change. If you’ve been missing a tooth or teeth for a while, there’s an increased likelihood that you may develop dental caries in a tooth that’s near the gap. The void also increases the possibility that your other teeth can shift, knocking your bite out of alignment and interfering with you ability to chew normally. In fact, if you have a tooth missing, you may be chewing only on the other side — even unconsciously. And that imbalance in the way you eat can mean you will develop problems with your jaw. One result can be painful TMJ. You’ve noticed a change in the way you look. Invariably, tooth loss leads to bone loss. Bone is being rebuilt continually through the natural operation of your teeth. When there is a tooth missing, the decreased stimulation to the underlying bone causes it to decrease in both width and height. Gum tissue deteriorates, and your ability to chew and speak can be impaired. But you lose more than function. Your teeth are also the support system for your mouth and face. When teeth are missing, you’ll see gradual structural changes to your face. Lips sag. Cheeks sink in. The lower part of your face will appear smaller, making you look older. If you have a tooth missing, you may have already cracked a tooth in the vicinity. Once you’ve lost a tooth, there can be a cascading deterioration in your oral health. At Pure Dental Health, our goal is always to help you preserve your smile and promote optimum oral health, which contributes to your overall health and well-being. You’re uncomfortable in public with your Essix retainer. 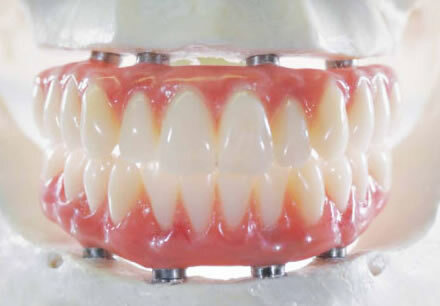 Have you been using an Essix retainer to compensate for missing teeth? It’s very effective, since no one can tell you’re wearing it. But as you know, you can’t chew with it, so you have to take it out to eat. That may not be a problem for you if you usually eat alone. But if you have a job that requires you to socialize, you know there’s no good way to accommodate your retainer. Are you looking for a job? If you have been, you know that a firm handshake and a confident smile can be as important as a solid resume in advancing your cause in an interview. If you’re missing teeth, you’re probably sabotaging yourself in the workplace. You’ve been told you should get dentures. If you’re missing teeth today, it’s useful to look back a couple of decades to review the kind of oral hygiene you practiced growing up. Poor self-care eventually catches up with you. Sometimes, there’s not much that can be done to save your teeth if you’ve neglected their proper care. Have you been told to consider full dentures? If so, you’ll definitely want to compare them with dental implants. Dentures are removable. They need to be held in place with adhesives you have to keep buying. But dental implants are permanent prosthetics that become a part of your jawbone. They look, fit and function just like natural teeth. You won’t be self-conscious about having a great-looking, healthy mouthful of teeth. If you’re ready to discuss getting dental implants, please contact us at Pure Dental Health today. Schedule an appointment for a free CD scan that we’ll use to evaluate your teeth and determine your options. Learn more about how we can help you restore your smile and make you want to share it with everybody. When deciding upon replacing a missing tooth, one of the first things most people consider is how much the different options cost. An equally important question one should consider however is how long the option will actually last. Asking both of these questions gives a better indication of the value. After all, what is getting something for half off if it doesn’t actually work or last? In addition to a dental implant, a dental bridge is an option for replacing missing teeth. When comparing the cost of a dental bridge to a dental implant, a dental implant is typically a larger investment. While a dental bridge can range from $3-4K dollars, an implant can be a $4-6K investment. Bridges are faster to make while implants take more time to complete. When only considering the financial factor, one might conclude that a dental bridge is a better value. How long will each last? It always depends on how well someone takes care of it. One way we can level the playing field is by taking a sample of people that have had a dental bridge and a sample of people that have had a dental implant, wait 10 years and see how many treatments are still in place. Studies very similar to this one show that the survival rate (how many that are still functioning and in place) for dental bridges are 50% while the survival rate of dental implants are 90-98%. So at 10 years, assuming you have a dental bridge go bad, you could wind up having to replace both the supporting teeth with dental implants and a brand new bridge. So now instead of just paying for one implant you have paid for two implants and two bridges. This puts us at $14-18K for half the cases. For many considering this, it makes the bridge more of a temporary option. All of these scenarios are based on averages and a lot of assumptions obviously. However, many have learned that, over time, a dental bridge is more of a risk than an implant. With anything in the dental field there are many variables that might make the dental bridge make more sense but just looking at the cost could bring you to a short sighted conclusion. Many times people come to our office to gather pricing for restoring their mouth with a dental implant. With multiple implants the figure can easily exceed 5 figures. That’s as much as a car! But here is a question, which is a better value? When you buy a car you don’t always buy a used car just because it is cheaper. You have to consider the cost of maintenance and how long it will last. The average car costs around $33,560 according to the Kelley Blue Book while the average length of time drivers keep their vehicle according to research by R.L.Polk is less than 6 years. Even at the low end, a 90% survival rate at 10 years for a dental implant really makes it a great value. Yet how many times per day do we use our teeth? Well typically 3, and we will be doing that everyday, 3 times a day, for the rest of our lives. Something to consider. All-on-4 Implants: Right 4 You? If you’re missing a tooth or two, dental implants have traditionally been the answer. But if you’re missing several or many teeth — and/or if a number of your teeth are on their “last legs,” so to speak — you might be a prime candidate for an All-on-4 implant. So what is an All-on-4? Well, here’s the idea: rather than individual implants for each missing tooth, the All-on-4 procedure replaces all of your teeth on the top or bottom — or both top and bottom, if needed — of your mouth. All-on-4 does this with just four implants (or “anchors”), rather than one for each tooth. In other words, if you had to replace all 14 (or 16) of your top teeth, you wouldn’t need 14 (or 16) individual implants. All-on-4 would replace them all with just four implants, giving you a whole new prosthetic arch, a brand new set of teeth, and a perfectly natural look. The procedure, invented in 1998 by a Portuguese dentist, has taken off in recent years as Baby Boomers age and develop greater needs in dental care. Hundreds of thousands have received the treatment and, according to one study, 98 percent of them would recommend it to others. How does it work? Four anchors are implanted into the upper or lower jawbone. Think of it sort of like putting a plastic anchor into drywall, and then attaching something with screws — a towel rack, for example — to that anchor. It holds firm. But with All-on-4, the anchor doesn’t go into the “drywall,” but the “stud” — the actual bone at the top or bottom of your mouth. So it essentially becomes part of the structure of your mouth, and holds really firm. Pure Dental Health serves patients with the All-on-Four procedure here at the Buckhead office. Since the All-on-Four is a more expensive treatment, so we offer a variety of financing and payment options to help meet your budgetary situation. Schedule a visit today for a free consultation to discover if this is the right treatment for you.